The Flibco / Bohr / Ryanair bus provides the cheapest way to travel from Flughafen Frankfurt-Hahn Airport (HHN) to downtown Frankfurt am Main and International Airport (FRA). This airport shuttle bus can be reserved through Flibco with special deals as cheap as €5. Some services may also be reserved through Flixbus or as IC Bus through German Railways. Getting to Frankfurt-Hahn Airport in western Germany from Frankfurt am Main on public transportation is easiest and cheapest on the Flibco airpot shuttle bus (operated by Bohr Omnibus and sometimes also referred to as the Ryanair bus). Online reservations are highly advisable and tickets can be as cheap as €5 but €16 is normal (€19 if bought on the bus). The bus service operates around 20 times per day between Frankfurt am Main Hauptbahnhof (Central Main Train Station) and Frankfurt-Hahn Airport (HHN). En route, all buses stop also at Frankfurt International Airport (FRA). The bus between Frankfurt-Hahn Airport and downtown Frankfurt am Main takes around 1h45 minutes. Some buses also calls in Simmern. Taxis and private airport shuttle services from Frankfurt-Hahn Airport are of course available too but expensive. For small groups not traveling to a destination readily served by public transportation taxis and shuttles may be a viable option but for most passengers the bus is the only sensible (and cheap) option. Taxi2Airport gives online quotations for private airport transfers without first requiring personal details or flight numbers. Frankfurt-Hahn Airport is a good 120 kilometers (75 miles) from the city Frankfurt am Main. This small airport is very popular with low-cost airlines and the major German hub of low-cost carrier Ryanair. Train services to Hahn are not available making the bus the best cheap option for most passengers. Fortunately, the bus service from Frankfurt-Hahn Airport to downtown Frankfurt am Main and Frankfurt International Airport (FRA) is well run with up to 20 daily buses operating on the route. (See Transportation to Frankfurt-Hahn for bus services to other cities in the region). Traveling time from Frankfurt-Hahn Airport to Frankfurt Hauptbahnhof is 1h45 (15 minutes less to Frankfurt International Airport). A few buses go via Mainz, which adds around 15 minutes to the journey to Frankfurt. The timetables of the Flibco airport bus (operated by Bohr Omnibus but often referred to as the Ryanair bus) varies according to the seasonal flight arrival and departure times. Flibco airport buses are usually available to ensure passengers arrive at the airport on time for the earliest flights of the day, as well as to provide transportation back to Frankfurt city for the final flight of the day. During peak hours buses usually run hourly. Online reservations ensure that passengers are certain of a seat on the bus but Flibco buses do not wait if flights are delayed. All Flibco buses on the Frankfurt-Frankfurt Hahn Airport (HHN) route also stop at Frankfurt International Airport (FRA) around 15 minutes from Frankfurt-Hauptbahnhof. Occasionally buses may also stop in Simmern, Ingelheim and Mainz. Hbf is the abbreviation for Hauptbahnhof, which means Main or Central Train Station. Therefore Frankfurt Hbf on a bus means the destination is the main central German railways (DB / Deutsche Bahn) train station in downtown Frankfurt am Main. 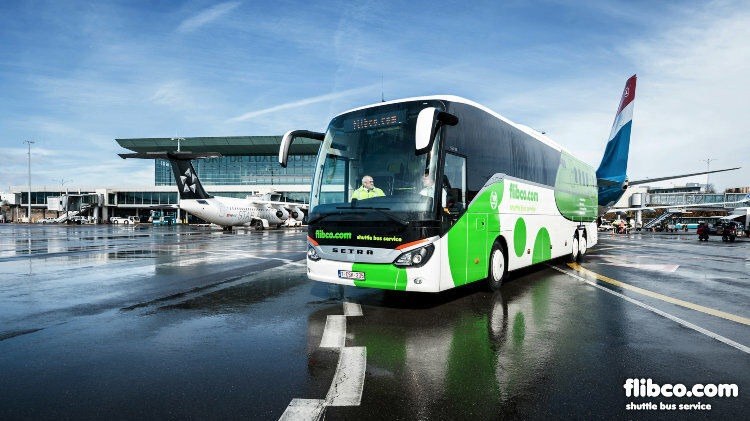 Currently, Flibco buses operated by Bohr Ominbus provide the only airport shuttle bus service between Frankfurt-Hahn Airport and Frankfurt am Main Hauptbahnhof and International Airport (FRA). The cheaper Terravision bus service that used to connect Frankfurt-Hahn Airport and Neu-Isenburg, Offenbach, and Hanau on the edges of Frankfurt am Main has been suspended. Tickets for the Flibco / Bohr bus journey to Frankfurt-Hahn Airport are cheapest and best bought online from Flibco.com. A few services per day may also be reserved through Flixbus or as a German Railways IC Bus but on the whole Flibco works out cheaper. The full-fare ticket is €19 but advance reservations for quiet periods can be as cheap as €5. Child fares and day-return tickets are no longer available, except for children under 4. However, if the bus is booked through German Railways as an IC Bus, the standard Deutsche Bahn rule of children under 15 traveling for free applies. The ticket price is the same whether traveling to Frankfurt International Airport of Frankfurt am Main Hauptbahnhof. Bus tickets bought in advance online guarantee a seat if at the bus 10 minutes prior to departure. Tickets bought directly from the driver are €19. At Frankfurt-Hahn Airport, tickets may also be bought in the terminal building at the information desk or the Flibco Bus ticket stand. Payment can only be made in cash and in euro – the bus driver may not necessarily have change for large notes. In contrast to the previous system, online purchases now guarantee a seat on the bus. If missing the bus due to a late flight arrival, the ticket remains valid for travel on the next bus with empty seats. Unused tickets are not refunded. Groups larger than six traveling together usually receive a discount if booking in advance. Free wifi and toilets are available on most buses. Wheelchair users should contact Flibco at least three days prior to traveling to ensure that a suitable bus / equipment is available on the particular bus. The Flibco airport shuttle buses are mostly in green and white with Operated by Bohr logos. However, other buses may also be used but will display clearly that it is the Flibco bus with destination. See also Transportation to Frankfurt-Hahn for Frankfurt-Hahn Airport shuttle bus services to other cities in the region. Taxi2Airport gives online quotations for private airport transfers without first requiring personal details or flight numbers. Book day tours and cruises in the Frankfurt am Main region.